But it wasn’t the 550 horsepower that caught everyone’s attention. It was the color. When the Pullins family ordered their newest BRON Drainage Plow, they added one request - paint it pink. For the Pullins family, installing agricultural drainage tile is their business and they rely on these massive machines to get the job done. However, their work is never far from their family life either. So when the Pullins family friend had breast cancer, the fight against cancer became personal. 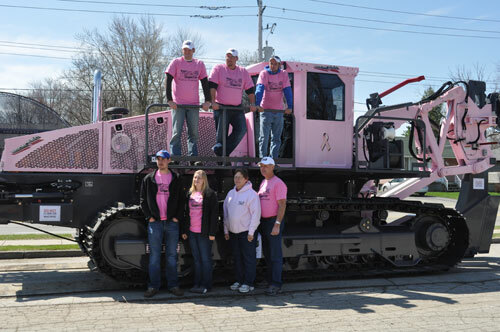 The new pink BRON 550 Drainage Plow is one way that the Pullins family felt they could bring awareness to the challenges of battling breast cancer. And indeed it already has. Paul Pullins Enterprises is based in Quincy, Ohio where the new pink plow will be working regularly. However before shipping it out, RWF BRON wanted to support their customer’s breast cancer awareness campaign by first canvassing their employees and family members and then holding a fundraising BBQ. On April 30th, RWF BRON hosted a special event in Woodstock, Ontario to commemorate the efforts of Paul’s family. More than 250 attended the festive event, enjoying grilled hamburgers and hotdogs and taking their best shot at soaking unlucky dunk tank participants. Deemed a great success, the event raised more than $ 6000.00, and additional donations are still to come. Proceeds were evenly donated to the Breast Cancer Society of Canada and the Stephanie Spielman Fund for Breast Cancer Research based at The Ohio State University. After discovering a lemon-sized lump during a breast self exam, Stephanie Spielman was diagnosed with breast cancer at the age of thirty. She and her husband, Chris, a former NFL player, began to speak publicly about the disease. In November 2009 after ten years of battling cancer, Stephanie finished fighting but left a legacy that has inspired thousands to continue on. Since 1999, more than $8.5 million has been raised on Stephanie’s behalf for breast cancer patients and research at The Ohio State University’s Comprehensive Cancer Centre, James Cancer Hospital and Solove Research Institute. Together RWF BRON and the Pullins family were proud to support the fight against breast cancer. For Paul and his family they hope their new pink 550 BRON Drainage Plow serves as a giant reminder that everyone can be part of the cure for breast cancer.